In 2004, we published our cutting-edge Feathered Dinosaurs, which showed all of the recently discovered species. The paleontologists have been very busy because they have since discovered a great many more of these fascinating critters. So many, in fact, that we had to create an all-new poster. It shows 37 species, a big jump from the 17 shown on the original one. There are now so many species that they are arranged by family, and each family is introduced. Surprisingly, some of these families are greatly unrelated to ones that were known to have feathered species. Dilong paradoxus has been the most controversial. It is a member of the tyrannosaur family, as is the famous Tyrannosaurus rex. The problem is that Dilong lived many millions of years earlier, and it had feathers. This suggests that the other tyrannosaurs which followed may have had them too. If so, then good ole T. rex might have looked like a really big and ferocious chicken. 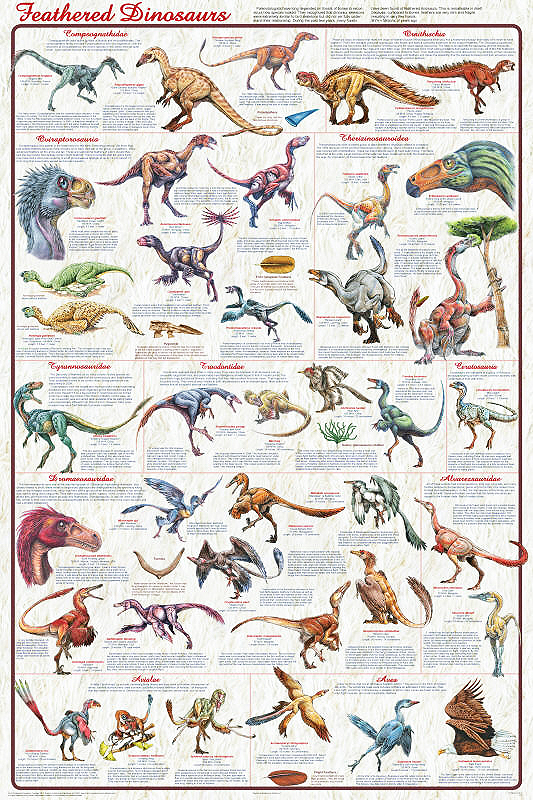 We do have a few hundred copies left of the original poster, A302 Feathered Dinosaurs, so we can continue filling orders for it until the supply runs out. The original will not be reprinted as this new version replaces it.